2018 Jerez MotoGP Test Day One Results—Ducati took the high ground at the first of two days of testing at Jerez, with new factory rider Danilo Petrucci heading the lists, and the only rider to break inside the 1:38 barrier, with a time of 1:37.968. This is inside the race lap record, but some three-tenths of the track’s best lap. Petrucci’s transition to factory equipment seems to suit him just fine. 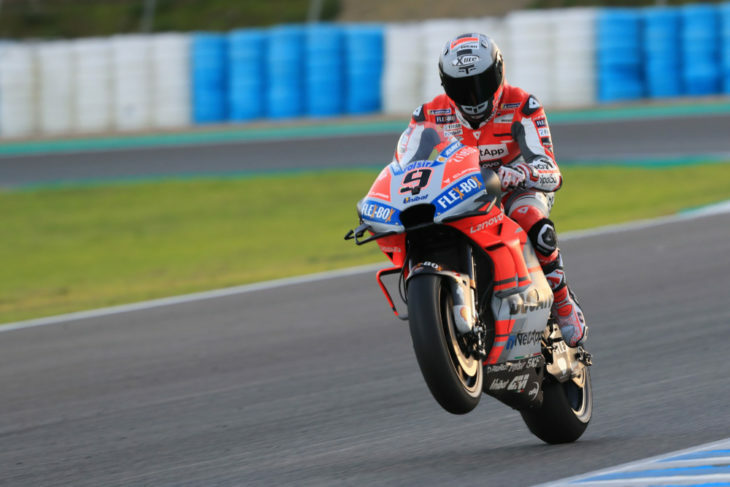 Teammate Andrea Dovizioso was barely a tenth slower in second place; with the Italian bikes testing new chassis ideas as well as engine upgrades. The main thrust it to improve turning; and with factory tester duties taken over by new Superbike recruit Alvaro Bautista, he was testing an aero seat, with winglets on each side. LCR Honda team rider Takaaki Nakagami was third-fastest, riding the absent Cal Crutchlow’s 2018 factory bike. The factory Repsol team riders were close, with Marc Marquez placed fifth, and Jorge Lorenzo seventh. The new teammates spent time circulating together; while Lorenzo’s bike had special bodywork—a wider seat and bigger dummy tank cover—much along the lines of the Ducati ergonomic modifications that took Lorenzo to three wins. Both were riding the 2019 prototypes, with a power-up engine upgrade. Ahead of Marquez, Maverick Vinales on the factory Yamaha, where the main work is to decide between two new specs of engine. But while the mood in the pit seemed positive, teammate Valentino Rossi was a distant 17th and telling Dorna that he could hardly notice any difference between the two. New satellite team rider Franco Morbidelli was a strong sixth place on the Petronas Yamaha, with new teammate Fabio Quartararo 15th. Rookie Joan Mir was impressive again on the Suzuki, placed 10th, ahead of new Aprilia rider Andrea Iannone. Both crashed during the day, as did Rossi and Dovizioso. Francesco Bagnaia (Pramac Ducati) was 14th on the GP18 Desmosedici; teammate Jack Miller had a good day on the GP19, placed eighth. 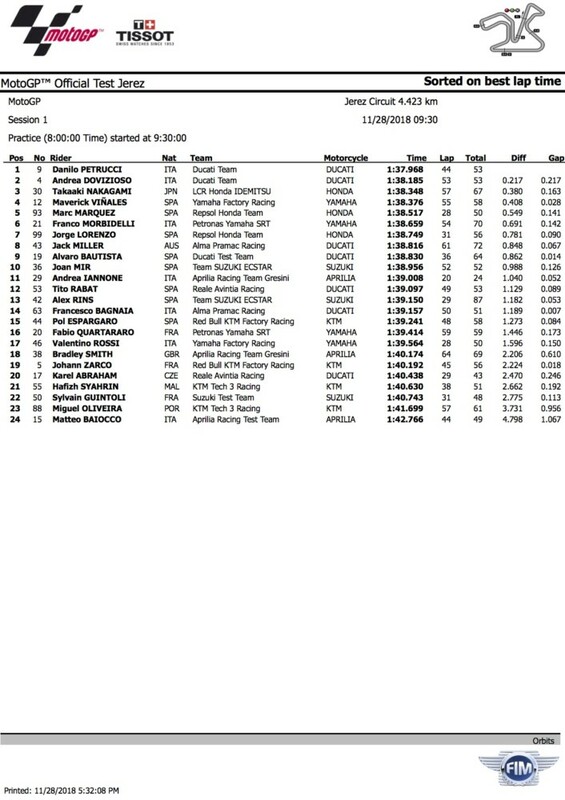 KTM still have work to do, with new rider Johann Zarco 19th and regular Pol Espargaro 16th. There is one more day of testing at Jerez, before the winter break. Aleix Espargaro was absent, stricken with a stomach bug, while Ducati’s Michele Pirro was undergoing surgery on the shoulder he injured in his very fast Mugello crash. Click here for all of the latest MotoGP news. Click here for all of the latest Road Racing news.